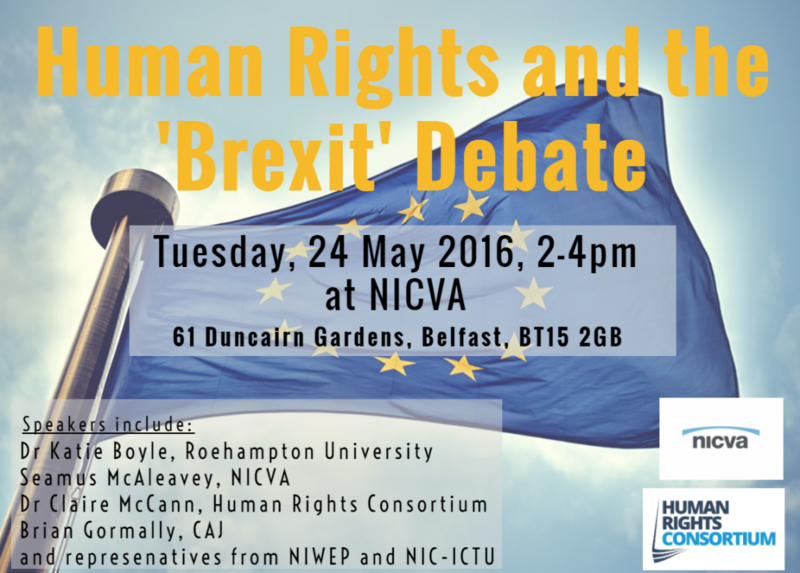 The Human Rights Consortium, in partnership with NICVA, is hosting an event to examine the missing human rights context in the EU referendum debate. Human rights have been largely ignored in the referendum debate and where rights have been mentioned, the discussion has been confused. The EU Charter of Fundamental Rights places the protection of rights as a foundational principle of EU law and, along with EU Directives, forms an essential part of the system of rights protection we enjoy in Northern Ireland and in other parts of the UK. This event will reassert human rights as a central issue in EU referendum and will distinguish current EU human rights protections from the debate on the Human Rights Act and the European Convention on Human Rights. Our expert panel includes Seamus McAleavey of NICVA, Dr Katie Boyle of Roehampton University, Brian Gormally of CAJ, Dr Claire McCann of the Human Rights Consortium, Seamus McAleavey of NICVA and Fiona McCausland of NIWEP, with additional perspectives from the trade union movement.